Periprosthetic joint infection (PJI) is a devastating complication of joint replacement surgery. In an aging population of the developed world, the increasing numbers of hip and knee replacements will inevitably lead to increasing incidence of PJI, carrying with (it) significant patient morbidity and cost to the health care system. Two-stage exchange arthroplasty is currently the gold standard but it is associated with multiple operations, prolonged hospitalization and impaired functionality. One-stage exchange arthroplasty is similar to the two-stage procedure but the interval between removal of the prosthesis and reimplantation of a new one is only a few minutes. It has the theoretical benefits of a single anesthetic, shorter hospitalization, less cost and improved function. We reviewed the current literature regarding the outcomes of one-stage exchange arthroplasties focusing on re-infection rates and functional outcomes. Current themes around the one-stage exchange procedure include the indications for the procedure, definition of re-infection, surgical techniques used to provide fixation and differences in approach for hip and knee replacements. The current literature on one-stage exchange procedure is promising, with comparable results to two-stage revisions for hips and knees in selected patients. However, there is a great need for a large multi-centred randomized control trial, focusing on re-infection rates and functional scores postoperatively, to provide concrete guidelines in managing this complex condition. Keywords: Direct exchange arthroplasty, Hip, Infection, Knee, One-Stage arthroplasty, Single stage revision. Although total hip and knee arthroplasties significantly improve pain, mobility and quality of life, periprosthetic joint infections (PJIs) can be a very serious complication of joint arthroplasty. PJIs are associated with significant morbidity, mortality and increased health care costs due to prolonged hospitalization and multiple surgical procedures [1, 2]. Despite taking every precaution to prevent PJIs, infection rates after a primary procedure remain as high as 1-2% [3, 4]. We hereby review the current literature regarding the outcomes of one-stage exchange arthroplasties (OSEA) focusing on re-infection rates and functional outcomes. This will lead to a better understanding of managing PJIs and realization of the need for high level evidence to objectively determine the role of one and two-stage revisions. Although several definitions for PJI exist, we prefer the Musculoskeletal Infection Society (MSIS) definition based on the strict criteria detailed in Table 1 . Table 1. Musculoskeletal Infection Society (MSIS) criteria for a definite diagnosis of PJI. However, it should be noted that PJI may be present even if fewer than four of these criteria are met. Timing of infection is one of the most important factors in guiding treatment as postulated by Tsukayama et al. . Acute postoperative infection presenting within a month of the index procedure is normally managed with irrigation and debridement (I&D), but this strategy has a much higher failure rate in late infections due to bacterial biofilm formation on the prosthesis after this timeframe. Therefore, delayed or late infections require exchange of the prosthesis in order to control infection  (Table 2). Table 2. Classification of infected total joint arthroplasties based on mode of presentation. Buchholz  introduced the OSEA in 1981 and since then it has slowly gained popularity as a treatment option for PJI in selected patients. Indications include a healthy uncompromised host, a known pathogen sensitive to available antibiotics and sufficient soft tissue envelope [8, 14, 15]. On the other hand, contraindications include an immunocompromised host, unknown pathogen or culture negative PJI, resistant pathogens and polymicrobial infections, patients with multiple comorbidities, major skin, soft tissue or osseous defects, infection involving the neurovascular bundles and peripheral vascular disease [15-17]. Although presence of a sinus tract has been associated with poor outcomes and hence considered an absolute contraindication to performing a one-stage revision by some authors [18, 19], evidence from the ENDO-Klinik suggest that one-stage revision is the treatment of choice even when a sinus tract is present in chronically infected total hip (THRs) and knee replacements (TKRs) [17, 20]. Additionally, polymicrobial infections and resistant pathogens are not considered a contraindication to a one-stage revision procedure according to the ENDO-Klinik experience whereby 85% of all septic revisions normally undergo a one-stage exchange procedure [17, 20, 21]. A multi-disciplinary approach is essential to treating patients with established PJIs utilizing a one-stage revision strategy [22, 23]. In particular, microbiologists play an important role in recommending appropriate systemic and local antibiotics delivered in the cement. Plastic surgeons may be required to provide appropriate cover for mild to moderate soft tissue defects. Excision of the scar and incorporating the sinus into the skin incision and excising it down to the capsule is essential . It is also important to remember that a radical total synovectomy after obtaining multiple tissue samples for microbiology and meticulous removal of any residual cement mantle are essential for satisfactory outcomes with one-stage revisions [6, 14, 23-26]. Pulsatile lavage and antiseptic solutions such as polymeric biguanide hydrochloride (polyhexanide), hydrogen peroxide and povidone-iodine are commonly used during the debridement [17, 27]. It is also routine that all drapes, gowns, gloves, suction tip, light handles and surgical instruments are changed prior to administration of antibiotics and reimplantation . Antibiotics added to the cement should be bactericidal, in the powder form, based on sensitivities of the pathogens grown preoperatively and not exceed 10% of the total weight of the cement powder in order to avoid alteration of the mechanical properties of the cement [17, 21, 27]. Autogenic and allogeneic bone grafting with or without the addition of antibiotics may also be considered for deficient bone stock . Alternatively, polymethyl methacrylate (PMMA) bone cement or Tantalum augments (Trabecular Metal, Zimmer Inc, Warsaw, IN, USA) may be used to address bone defects. The choice of implants depends on the radical debridement which may require excision of the collateral ligaments in TKRs and hence the use of semi to fully constrained implants and residual bone stock [17, 21, 27]. A drain is usually applied to avoid postoperative hematoma formation but is normally removed within 24-48 hours [20, 27]. The literature has varied in the route and period of systemic antibiotic administration postoperatively but despite an overall shorter period in comparison to two-stage revisions (2 vs. 6 weeks), it remains important to liaise with the microbiologists regarding appropriate treatment on an individualized basis [15, 17, 27]. Early mobilization is recommended with weightbearing using crutches either immediately or gradually over 2 weeks according to the reconstruction performed [17, 21]. Follow-up for infection control includes clinical and serological assessments and if necessary a repeat aspiration with analysis of the aspirate to confirm resolution of infection . Most of the available studies reporting on OSEA have focused on late chronic infections which according to Tsukayama were the culprit for failure of infection control. Taking into account that I&D has been associated with high re-infection rates in this subgroup of patients [28, 29], exchange arthroplasty is theoretically the more appropriate treatment. However, the literature lacks comparative studies of one versus two-stage revision and I&D in both acute and chronic infections. In a recent study, Hansen et al. reported on 27 patients who underwent a one-stage cementless hip arthroplasty revision for acute infections within 6 weeks of the index procedure. Using retention of implants as the primary end point, their infection control rate was 70% at a mean follow up of 51 months, but this figure included 2 patients with methicillin-resistant Staphylococcus aureus (MRSA). Exclusion of these patients improved the infection control rate to 76%. The authors admitted that despite the potential benefits of using available primary implants, the result is still inferior to a one-stage procedure using cemented prostheses, which yields a success rate of around 80% . Another area of interest is the choice between cement with or without antibiotics. Buchholz pioneered the mixing of antibiotics with cement and achieved infection control rate of 77% with one-stage exchange and up to 90% after subsequent exchange procedures in a large series of 583 patients . Since then, the success rate of one-stage exchange with antibiotic loaded cement varied widely from 76 - 100%, but the end points measured also varied from retention of prosthesis to aseptic loosening [6, 8, 14, 16, 30-33]. It is important to remember that the mechanical strength of cement is affected by high doses of antibiotics added to the cement together with poor cementing techniques aimed at improving antibiotic elution in the surrounding tissues. Therefore, one-stage revision with cement alone has been preferred by some surgeons who published comparable results of infection control (78 - 92.3%) but on smaller numbers of patients [26, 34-36]. Zeller et al. were the only group to publish on a large cohort of 157 patients of PJIs treated with one-stage exchange arthroplasty and twelve weeks of systemic antibiotics and no antibiotics in the cement. Two relapses and six new infections were observed during follow-up, with a cumulative infection control rate of 95% at five years postoperatively. One-stage revision with cementless prostheses and bone grafts has recently been proposed as an alternative by Yoo et al. to reduce the need for specialized prostheses. In a series of 12 patients, an infection control rate of 83.3% was achieved at an average follow up of 7.2 years. Loty et al. also reported good functional results in 79% of cases reconstructed with allografts. Winkler et al. expanded on the idea of using antibiotic impregnated bone grafts in a series of 37 hips and 6 knees with overall infection control rate of 94.6% for hips and 100% for knees. However, the finding of 2 reinfected hips at the last follow up may suggest that the average follow up of 3.2 years was too short . Studies comparing the one vs. two stage revisions in infected THRs showed improved infection control rates in one-stage revisions ranging from 82-100% compared to 75-95% in two-stage revisions [8, 32, 33]. However, it is important to note that the one-stage patients were highly selected according to criteria set up at each center in line with the indications outlined above. Fig. (1). Infected left total hip arthroplasty underwent one-stage revision using a constrained revision cup and a cemented stem at the ENDO-Klinik in Hamburg. Infection control rates reported for I&D of periprosthetic knee infections range from 16 - 80% [18, 19, 41]. In particular, patients with acute postoperative infections due to low virulent organisms do well with aggressive early debridement and exchange of the insert. This could be the reason why we found no reports of one-stage revision for acute infection in TKRs. Since the initial report from the Endoklinik in Germany  showing an infection control rate of 73%, other series have kept to the same principles of removal of the implant, I&D and reimplantation of a new prosthesis, mainly with antibiotic loaded cement. Reported infection control rates ranged between 73% and 100% [9, 23, 42-46]. Buechel  and Singer  also demonstrated good to excellent function in a majority of the patients who underwent one-stage revisions, with a mean Knee Society Score (KSS) of 79.5 and 72 respectively [43, 45] which is higher than that reported for two-stage revisions. Haddad et al. in a recent study directly compared one and two stage revision surgery in chronically infected TKRs and also reported higher KSSs in the one-stage group (88 vs. 76, p<0.001) with overall 100% infection control in the one stage vs. 93% in the two-stage revision group. The Endoklinik also reported their 10-year infection-free survival for one-stage infected TKRs as 93% (mean 4.1; 95% confidence interval, 89%-96%; p < 0.007); and the patient 10-year survival rate free of revision for other causes as 91% (mean, 5.2; 95% CI, 86%-95%; p < 0.002) (20). In a recent meta-analysis comparing the outcomes following one and two stage revisions of infected TKRs, the rate of re-infection was reported as 7.6% in one-stage studies. The corresponding re-infection rate for two-stage revision was 8.8%. Postoperative clinical outcomes of knee scores and range of motion were similar for both revision strategies. However, it is worth noting that the number of available one-stage revision studies is limited and hence further studies are needed to explore heterogeneity and support the findings of this meta-analysis . (Fig. 2). Fig. (2). Infected left total knee replacement underwent one-stage revision at the ENDO-Klinik. PJIs continue to be a management challenge to clinicians worldwide. The heterogeneity of PJI and resulting lack of consensus regarding its definition and diagnosis further confound the lack of high power studies to determine the optimal treatment strategy. The goal of successful eradication of infection while preserving functionality presents a delicate balance between I&D with retention of the prosthesis and one and two-stage exchange arthroplasty. In the last 40 years, OSEA has been shown to be a viable treatment option for both hips and knees in selected patients. All authors reached a rare consensus advocating its use in non-immunocompromised patients with known low virulent microorganisms, no sinus tract and good soft tissue coverage. Although current data is restricted to small cohorts at individual centers, the re-infection rates are comparable to their two-stage counterparts while showing superior functional scores and reduced cost. The practicality of one-stage revision, however, is still limited geographically to specific centers where it is believed to be superior to two-stage revision. There is also a wide variation in the definition of re-infection and techniques used to provide fixation for the new prostheses. Attempts at collation of the current data yield the same conclusion that there is a great need for a large multi-centred randomized control trial, focusing on re-infection rates and functional scores postoperatively, to provide concrete guidelines in managing this complex condition. Bozic KJ, Ries MD. The impact of infection after total hip arthroplasty on hospital and surgeon resource utilization. J Bone Joint Surg Am 2005; 87(8): 1746-51. Bratzler DW, Hunt DR. The surgical infection prevention and surgical care improvement projects: national initiatives to improve outcomes for patients having surgery. Clin Infect Dis 2006; 43(3): 322-30. Wilson J, Charlett A, Leong G, McDougall C, Duckworth G. Rates of surgical site infection after hip replacement as a hospital performance indicator: analysis of data from the English mandatory surveillance system. Infect Control Hosp Epidemiol 2008; 29(3): 219-26. Haddad FS, Masri BA, Campbell D, McGraw RW, Beauchamp CP, Duncan CP. The PROSTALAC functional spacer in two-stage revision for infected knee replacements. Prosthesis of antibiotic-loaded acrylic cement. J Bone Joint Surg Br 2000; 82(6): 807-12. Buchholz HW, Elson RA, Engelbrecht E, Lodenkämper H, Röttger J, Siegel A. Management of deep infection of total hip replacement. J Bone Joint Surg Br 1981; 63-B(3): 342-53. Gulhane S, Vanhegan IS, Haddad FS. Single stage revision: regaining momentum. J Bone Joint Surg Br 2012; 94(11)(Suppl. A): 120-2. Oussedik SI, Dodd MB, Haddad FS. Outcomes of revision total hip replacement for infection after grading according to a standard protocol. J Bone Joint Surg Br 2010; 92(9): 1222-6.
 von Foerster G, Klüber D, Käbler U. Mid to long-term results after treatment of 118 cases of periprosthetic infections after knee joint replacement using one-stage exchange surgery. Orthopade 1991; 20(3): 244-52. Parvizi J, Zmistowski B, Berbari EF, et al. New definition for periprosthetic joint infection: from the workgroup of the Musculoskeletal Infection Society. Clin Orthop Relat Res 2011; 469(11): 2992-4. Tsukayama DT, Estrada R, Gustilo RB. Infection after total hip arthroplasty. A study of the treatment of one hundred and six infections. J Bone Joint Surg Am 1996; 78(4): 512-23. Haddad FS, Bridgens A. Infection following hip replacement: solution options. Orthopedics 2008; 31(9): 907-8. Vanhegan IS, Morgan-Jones R, Barrett DS, Haddad FS. Developing a strategy to treat established infection in total knee replacement: a review of the latest evidence and clinical practice. J Bone Joint Surg Br 2012; 94(7): 875-81. Ure KJ, Amstutz HC, Nasser S, Schmalzried TP. Direct-exchange arthroplasty for the treatment of infection after total hip replacement. An average ten-year follow-up. J Bone Joint Surg Am 1998; 80(7): 961-8. Zahar A, Gehrke TA. One-Stage revision for infected total hip arthroplasty. Orthop Clin North Am 2016; 47(1): 11-8. Zahar A, Kendoff DO, Klatte TO, Gehrke TA. Can good infection control Be obtained in One-stage exchange of the infected TKA to a rotating hinge design? 10-year results. Clin Orthop Relat Res 2016; 474(1): 81-7. Kendoff D, Gehrke T. Surgical management of periprosthetic joint infection: one-stage exchange. J Knee Surg 2014; 27(4): 273-8. Masters JP, Smith NA, Foguet P, Reed M, Parsons H, Sprowson AP. A systematic review of the evidence for single stage and two stage revision of infected knee replacement. BMC Musculoskelet Disord 2013; 14: 222. Callaghan JJ, Katz RP, Johnston RC. One-stage revision surgery of the infected hip. A minimum 10-year followup study. Clin Orthop Relat Res 1999; (369): 139-43. George DA, Konan S, Haddad FS. Single-Stage hip and knee exchange for periprosthetic joint infection. J Arthroplasty 2015; 30(12): 2264-70. Wroblewski BM. One-stage revision of infected cemented total hip arthroplasty. Clin Orthop Relat Res 1986; (211): 103-7. Raut VV, Siney PD, Wroblewski BM. One-stage revision of total hip arthroplasty for deep infection. Long-term followup. Clin Orthop Relat Res 1995; (321): 202-7. Klouche S, Leonard P, Zeller V, et al. Infected total hip arthroplasty revision: one- or two-stage procedure? Orthop Traumatol Surg Res 2012; 98(2): 144-50. Hughes PW, Salvati EA, Wilson PD Jr, Blumenfeld EL. Treatment of subacute sepsis of the hip by antibiotics and joint replacement. Criteria for diagnosis with evaluation of twenty-six cases. Clin Orthop Relat Res 1979; (141): 143-57. Jupiter JB, Karchmer AW, Lowell JD, Harris WH. 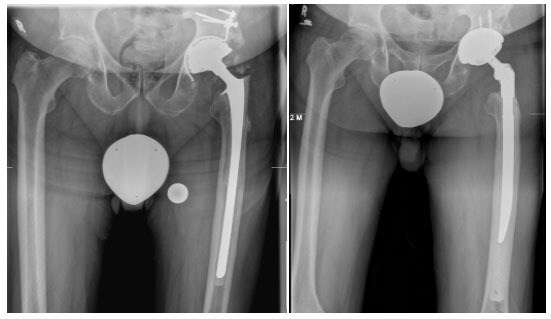 Total hip arthroplasty in the treatment of adult hips with current or quiescent sepsis. J Bone Joint Surg Am 1981; 63(2): 194-200. Zeller V, Lhotellier L, Marmor S, et al. One-stage exchange arthroplasty for chronic periprosthetic hip infection: results of a large prospective cohort study. J Bone Joint Surg Am 2014; 96(1): e1. Loty B, Postel M, Evrard J, et al. One stage revision of infected total hip replacements with replacement of bone loss by allografts. Study of 90 cases of which 46 used bone allografts. Int Orthop 1992; 16(4): 330-8. Winkler H, Kaudela K, Stoiber A, Menschik F. Bone grafts impregnated with antibiotics as a tool for treating infected implants in orthopedic surgery - one stage revision results. Cell Tissue Bank 2006; 7(4): 319-23. Leonard HA, Liddle AD, Burke O, Murray DW, Pandit H. Single or two-stage revision for infected total hip arthroplasty? A systematic review of the literature. Clin Orthop Relat Res 2014; 472(3): 1036-42. Hartman MB, Fehring TK, Jordan L, Norton HJ. Periprosthetic knee sepsis. The role of irrigation and debridement. Clin Orthop Relat Res 1991; (273): 113-8. Göksan SB, Freeman MA. One-stage reimplantation for infected total knee arthroplasty. J Bone Joint Surg Br 1992; 74(1): 78-82. Buechel FF, Femino FP, DAlessio J. Primary exchange revision arthroplasty for infected total knee replacement: a long-term study. Am J Orthop 2004; 33(4): 190-8. Parkinson RW, Kay PR, Rawal A. A case for one-stage revision in infected total knee arthroplasty? Knee 2011; 18(1): 1-4. Singer J, Merz A, Frommelt L, Fink B. High rate of infection control with one-stage revision of septic knee prostheses excluding MRSA and MRSE. Clin Orthop Relat Res 2012; 470(5): 1461-71. Lu H, Kou B, Lin J. One-stage reimplantation for the salvage of total knee arthroplasty complicated by infection. Zhonghua Wai Ke Za Zhi 1997; 35(8): 456-8. Kunutsor SK, Whitehouse MR, Lenguerrand E, Blom AW, Beswick AD. Re-Infection outcomes following One And Two-Stage surgical revision of infected knee prosthesis: A systematic review and Meta-Analysis. PLoS One 2016; 11(3): e0151537.